Viet-AID’s Four Corners housing project: The Boston Redevelopment Authority’s board approved a Viet-AID project last week that will build 35 units of new housing on 9 vacant lots in Four Corners. Above, an artist’s rendering of the residential development proposed for 324 Washington St.The Boston Redevelopment Authority, a city planning agency that has accelerated its reviews of projects as Mayor Thomas Menino’s 20-year tenure nears its end, last week signed off on a Dorchester project in the Four Corners neighborhood by approving a Vietnamese American Initiative for Development (Viet-AID) project for 9 vacant parcels to be turned into 35 affordable housing units. Viet-AID, an organization based in Fields Corner that started with converting an empty garage in the area into a community center, submitted a letter of intent about the Four Corners project in July. Nine of the 35 units will be set aside for “extremely low-income homeless or formerly homeless” families, with 3,200 square feet of commercial space on the first floors in locations along Washington Street between Bowdoin Avenue and Harvard Street, according to the letter. The $14.3 million project is split into two buildings: 324 Washington Street will be a four-story building with townhouse units, while 331 Washington Street will have three stories. In other details, 25 percent of the units will have three bedrooms, and 25 parking spaces will be available to residents. The project is situated between two MBTA lines – the commuter rail’s Four Corners station a half a mile to its northwest and the Fields Corner Red Line MBTA Station to the east. In addition, the local No. 23 bus goes to Ruggles T Station on the Orange Line and the Red Line’s Ashmont T Station. The project has received letters of support from community groups and both mayoral candidates, state Rep. Marty Walsh and City Councillor At-Large John Connolly, as well as District 4 Councillor Charles Yancey and District 3 Councillor Frank Baker. Separately, a second project that was submitted to the BRA will instead be presented to the Zoning Board of Appeals, because it does not meet the 20,000 square foot threshold of new construction that would trigger a BRA review. 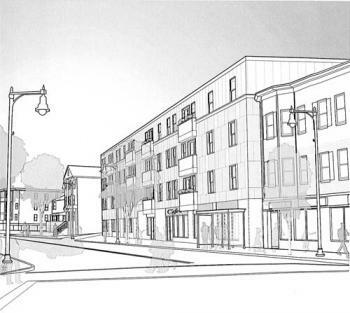 The Talbot Commons project, put together by the Codman Square Neighborhood Development Corporation, includes 18 affordable housing units and a common artist space at the intersection of New England Avenue and Talbot Avenue. The project, which includes vacant parcels at 14 New England Ave. and 15 Mallard Ave., has picked up support from the Talbot Norfolk Triangle Neighbors United group and the Codman Square Neighborhood Council. Construction, if the project picks up the rest of the necessary approvals, is tentatively scheduled to be completed by December 2015. The project is also close to several transit options, from the Talbot commuter rail stop down the street, to the Shawmut Red Line Station a mile away, to the No. 22 bus between Ashmont and Jackson Square Stations.